Srinagar: Joint Resistance Leadership (JRL) on Sunday held a meeting during which they urged the United Nation Human Rights Commision (UNHRC) to implement its Kashmir report besides expressing serious concern over the plight of Kashmir political prisoners lodged in jails. 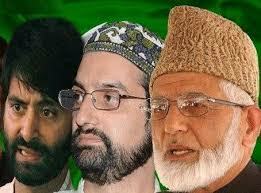 JRL, comprising of Syed Ali Geelani, Mirwaiz Umar Farooq, and Muhammad Yasin Malik held a meeting at the Geelani’s residence located at the Hyderpora residence. In the meeting, JRL urged the UNHRC to implement its report on the human rights situation in Kashmir that UN Secretary-General keeps referring to. “It is incumbent upon the Secretary-General not only to urgently take steps to mitigate the grave human right abuse perpetuated by the Indian state in J&K which the UN report elaborates, but ensure that the commitment made by the August body to the people of entire J&K of resolving the Kashmir dispute is upheld by implementing the UN resolutions on it,” the JRL stated. The dispute continues to remain hanging since past over 70 years and it is long overdue that UN play its role in resolving one of world’s oldest disputes, they added. Expressing serious concern over the perpetual incarceration of many political prisoners languishing in outside Kashmir jails and the ill plight and inhuman treatment meted out to Kashmiri political prisoners lodged in various jails including Tihar Jail ,Kathua, Udhampur, Kotbalwal, Samba, Haryana, Rajasthan, Jodhpur, the JRL stated and other prisons stating that world organizations should take strong note of the condition of Kashmiri prisoners lodged in these prisons. “They should also take note of how legal processes and procedures are misused to detain them and prolong their detentions,” the trio stated in a statement. The JRL said most Kashmiri inmates lodged in these prisons are serving detention for no offence other than their political ideology and their commitment towards the Kashmir dispute. “Prolonging the detention of Kashmiri prisoners even after they have served sentences and delaying bringing of charges and proper trial to prolong detention is a well planned conspiracy to harass Kashmiri’s and sheer vendetta,” it stated. At the meeting leadership expressed satisfaction over the verdict announced by the seven judge-bench of Pakistan Supreme Court that upheld the disputed status of Jammu and Kashmir and directed the Pakistan government to provide more citizenship, legal and social rights to the people of Gilgit and Baltistan besides stating that the lingering dispute of J&K be resolved by means of plebiscite. The Leadership said that Pakistan Supreme Court in its fresh verdict has laid stress on the fact that till the issue of Kashmir stands unresolved, Pakistan and India must ensure that the people of this region enjoy maximum rights for areas within each country’s control. The leadership strongly condemning the arrest and shifting of three South Kashmir youth Amir Shafi Bhat, Mohammad Shafi Mir and Suhail Ahmad Wagay to Kotbalwal Jail Jammu under PSA demanded unconditional release of all the Kashmiri political prisoners.